Wrigley Roster Jenga: The NSCC - Holy Sheet! Here we are, day three of my humble bragging about what I was lucky enough to come across at the. National Sports Collectors Conference. 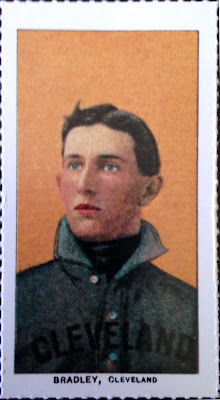 So far, in part one, I gave you the general overview of what I uncovered while wandering, mouth agape, about the Donald E. Stephens Convention Center in nearby Rosemont, IL; plus, you got to check out the hottest rookie card to hit the market (forget Judge and Bellinger). 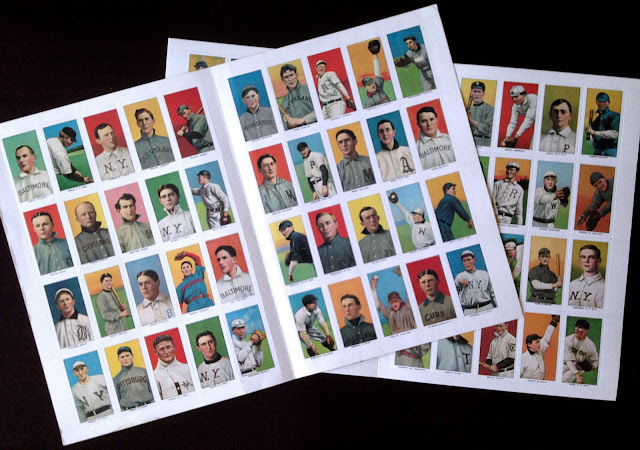 Then, in part two, I went completely "postal," in that I spent our time together showing off the postcards of long-forgotten Cubs players of yore which just so happened to fill some gaps in my CATRC binder that I wasn't sure would ever be filled. For once, "mailing it in" wasn't a bad way to approach a blog post! With that, I know you must be on the edge of your seat, desperate to find out what we'll be gazing at with awe today. So, let's get right down to business. 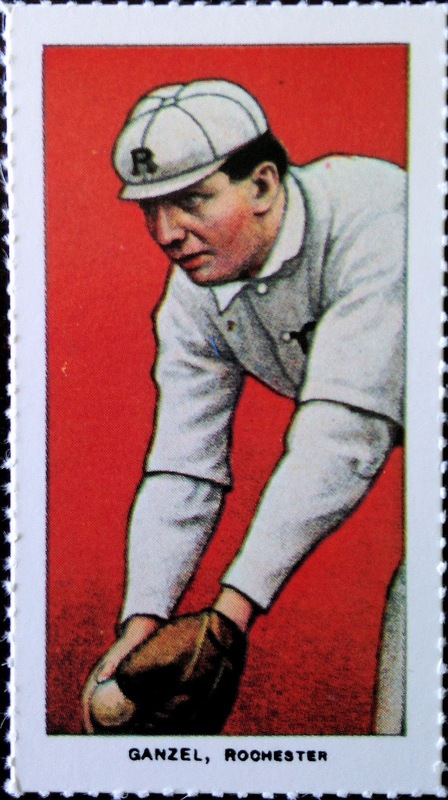 As I've mentioned countless times throughout this blog's history, at this point in my CATRC, most of the players I'm chasing hail from the 1940s and earlier and, thus, lack the cardboard footprint of more modern ball players. This means that, oftentimes, my selections are limited to super vintage and ultra rare curiosities - not friendly to this penny-pinching collector. 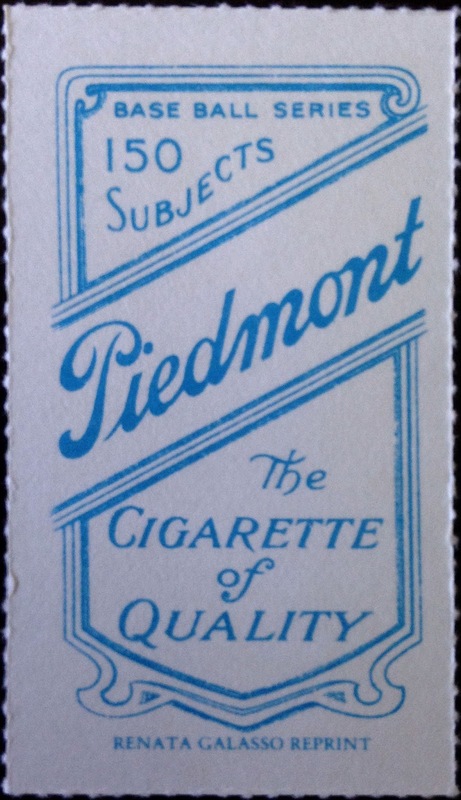 When I come across them, I'm content to let reprints hold down the fort until I win the lottery enough times to buy the stacks of strip and tobacco cards I'll need to complete my task. That's why, when I saw this stash of oddballs at one vendors table, all I could think was "holy sheet - these are going to fill in a bunch of gaps:"
Entire, un-separated sheets of Renata Galasso T206 reprints! Now we're cooking with gas. There are upwards of a dozen subjects in what might be the most famous baseball card issue of all-time who have thus far eluded my grasp. If I were to sit around and wait until I scrounged up enough funds to purchase all of those singles, I might be paying for them with my first retirement check. Thanks to the revered Renata Galasso, the queen of oddball baseball cards, and her reprints of the early 1980's, I can now cross some of these names off of my "need" list without taking food out of my own mouth. You know what that means, I definitely perforated these bad boys - sorry, not sorry. At this particular table, the seller had four different, full sheets available for purchase. However, sadly, my limited, cash only budget only had enough wiggle room for me to land two of them. Moral of the story - always make sure you have your debit card BEFORE you peel out from an ATM. Oh well, I think Meatloaf would still agree that two out of four ain't bad - heck, you're batting .500! Renata released this set of T206 reprints in both perforated sheets and as a boxed set, circa 1983. As I am writing this, I see no confirmation that her re-do's contain all of the original cards from "the Monster" (as the large set is affectionately known); however, that is certainly doubtful. A lot of the big names of the era are included on the sheets that I did end up pulling the trigger on - Mordecai Brown and his three fingers, Joe Tinker (sans his poetic teammates), plus some non-Cubs notables like that Cy Young fellow and Tris Speaker. Of course, being the roster obsessed collector I am, the only names that concerned me were the obscure ones. I'm talking about guys like Johnny Bates and Jake Weimer, Deadball Era players whose fame did not translate through the decades. 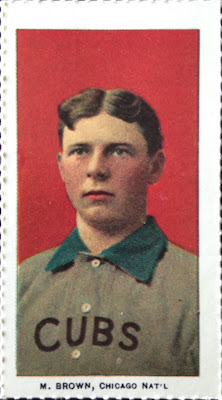 The former, Bates, was a regular in the outfield for the Boston (as pictured), Philly, and Cincy clubs from 1906-13, before being released mid-season in '14. 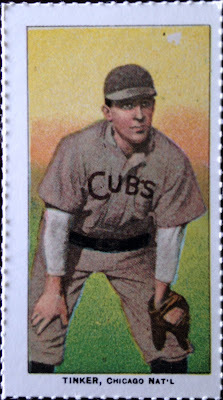 Nearing the end of his rope, Johnny inked a deal with the Cubbies, with whom he finished out the year with nine more games with one hit in eight at-bats. 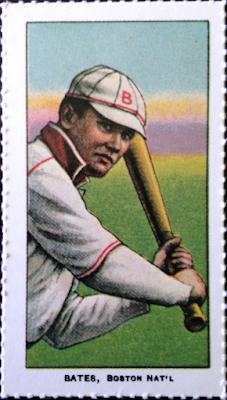 After one more year with the rebel Federal League in Baltimore, Bates racked his Major League bat for the last time. Meanwhile, Jake Weimer broke in immediately as regular in the Cubs' starting rotation in 1903, posting a 20-8 record and never winning less than 18 contests in his three total seasons in the Windy City. With a strong starting staff and an opening at third base, Chicago decided to swap Weimer to the Reds for Jimmy Sebring and the answer to everyone's favorite trivia question, Harry Steinfeldt. Of course, that trivia question is, "who played third base during the Tinker-to-Evers-to-Chance era?" Just a couple o' Bills here. Bill Bradley was a longtime Cleveland Blue/Nap/Indian; but, he broke into the Bigs with the Chicago National League franchise, before the turn of the century, in 1899. 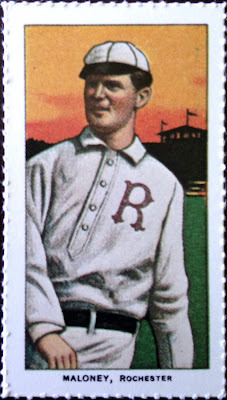 After playing a year and a half as the starting third baseman for the then-Orphans, Bradley "jumped" on over to Cleveland in pursuit of a more lucrative offer to play in the newly-formed American League. Billy Maloney did some jumping himself, from team-to-team, throughout the first decade of the twentieth century. 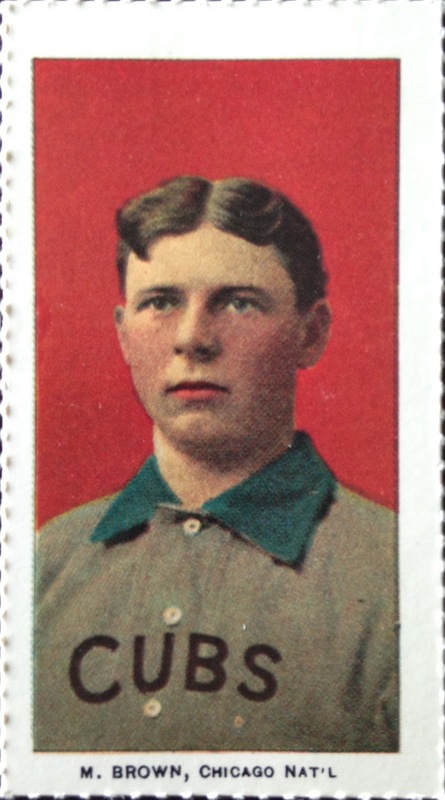 During his sole season with the Second City, Maloney managed to lead the NL in stolen bases, with 59 swipes. Of course, he also lead the league in strikeouts, with all of 59 - 'twas simply a different time. Also, gotta love the old-timey field (that almost looks more like a carnival than a ballpark) in the background of Billy' lithograph. 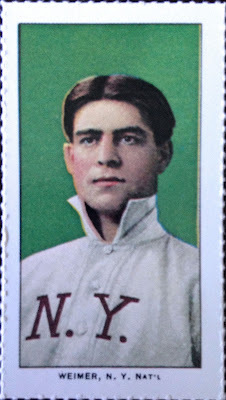 Finally, here's the card I was most happy to see included on these Galasso sheets: John Ganzel. Ganzel was a teammate of Billy Maloney's at Rochester when this set was originally released in cigarette packages. By then, he was nine-years removed from his one year stint with the Chicago club. Of course, playing as a first baseman there was a fool's assignment, seeing as HOF'er Frank "The Peerless Leader" was firmly entrenched and not going anywhere. As such, Ganzel was traded away after just 78 contests in 1900. Not to be deterred, John stuck around in the pro ranks all the way through the 1918 season. That's right - Ebay notifications are the true reason... they've been driving me bonkers. Granted, that is a rather short drive. I, like many a collector, have a ton of saved searches on my Ebay account, lest a card that I desire show up and run right under my nose. Additionally, I have notifications turned on for that very same reason - simply put, like Aerosmith, I just don't want to miss a thing. For whatever reason, I'd been getting pop up notes for "new items" in relation to Mr. Ganzel, at the rate of at least once a day, for several weeks. A rational person might have just turned off notifications or deleted that search; but, I just knew that if I did that, someone would list an off-condition, Ganzel T206 for a bargain basement price and I would miss it. Like I said, short drive. Regardless, my long, national nightmare is now over - I have a Ganzel and I can stop following that search, with it's kooky, rogue pop ups. Btdubs, that photograph on my lock screen comes from a charity promotion put on by the local commuter railroad earlier this summer. They brought in the "Joliet Rocket" (NKP 765) to roll down our line, pulling a special excursion train. Seeing as another one of my longstanding passions is railroading and it's history, watching this galloping 2-8-4 steam locomotive roar through town made my hair stand on end. It's incredible to think that when guys like Ganzel, Maloney, Bradley, Weimer and Bates were entertaining fans on the diamond, this was simply a normal, everyday scene. Anyway, all told, courtesy of the Renata Galasso discovery, I was able to add five new names to my Cubs All-Time Roster Collection binder that otherwise might have taken me years to track down elsewhere. Thank you for your oddballs and reprints, Mrs. Galasso - this collection would look drastically different without your efforts! This concludes part three of the series about my finds at the National. Stay tuned, for tomorrow we will wrap everything up, with a tidy bow on top, with a potpourri. Oddballs? Check ✅. 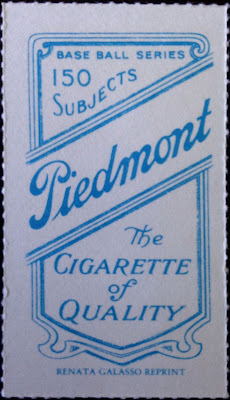 Ultra vintage? Check ✅. Refractors? Check ✅. We're going to go out with a grand finale-like bang. All you'll be able to say is, "holy sheet!" 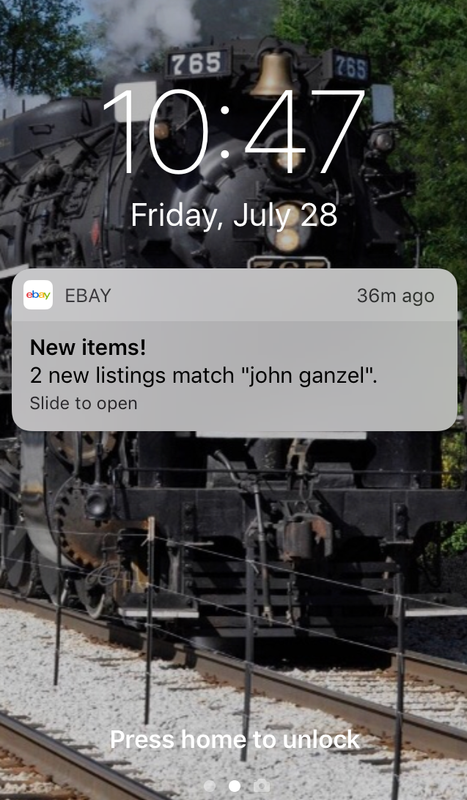 I can relate to you on that iPhone notification thing with eBay. I have probably 80 saved searches but the only one that pops up on my phone daily is "Atomic Jeter" (I'm in search if his 2011 Topps Chrome Atomic Refractor. Drives me nuts! Oh yeah, and those sheets are the sheet! Great find there! I would've separated those sheets in a heartbeat as well -- single cards I can put in binders are much more pleasurable to me than big display-type pieces I've never quite known what to do with. I echo Nick! Sheets of Galassos, a great find but fit better into the collection as singles. Renata had no idea the impact her cards would make on the hobby. Nice find...since you only got 2 of the 4, how many Cubbies were on the 2 sheets you didn't get to pick up? Sweet sheets! Looking forward to seeing tomorrow's potpourri. Yup, I woulda separated em as well. Great find!